University of North Texas Press, 9781574417128, 272pp. 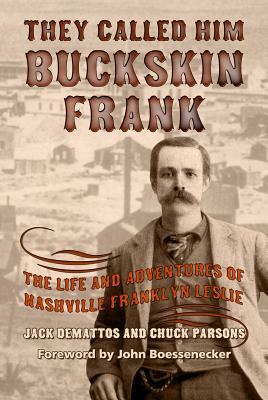 Nashville Franklyn “Buckskin Frank” Leslie was a man of mystery during his lifetime. His reputation has rested on two gunfights—both in storied Tombstone, Arizona—but he was much more than a deadly gunfighter. Jack DeMattos and Chuck Parsons have combined their research efforts to help solve the questions of where Leslie came from and how he died. Leslie developed a reputation as a man to be left alone. Such notables as the Earps, Doc Holliday, and John Ringo wisely avoided confrontations with him. Leslie was a “lady killer” both figuratively and—in one celebrated incident—literally. Beyond his gunfighting legacy, DeMattos and Parsons also explore Leslie’s scouting with General Crook on the Great Plains and his alleged service as a deputy for Wild Bill Hickok in Abilene, Kansas. JACK DeMATTOS is the author of seven books on western gunfighters, including The Notorious Luke Short co-authored with Chuck Parsons. He lives in North Attleboro, Massachusetts. CHUCK PARSONS is the author of Captain John R. Hughes and The Sutton-Taylor Feud and coauthor of A Lawless Breed, a biography of John Wesley Hardin. He lives in Luling, Texas.